BAM, please give our love and news to the JCFN gang of old. They were irreplaceable when we moved to DC. Have a wonderful tasty time and we’ll raise a glass to all of you and the memories! One more thing…taking out grandma’s china and wiping it down is almost a religious ritual before gatherings. And that is book-ended by washing it late at night after the guests have left and all have gone to bed. It is my quiet moment to reflect on the stories heard and appreciate this created family of international friends. (No one will forget the Indian woman and the Chinese woman teaching Jewish husband the proper way to make rice for the Christmas meal!) Grandma’s kolachi cookies are appreciated by every nationality. 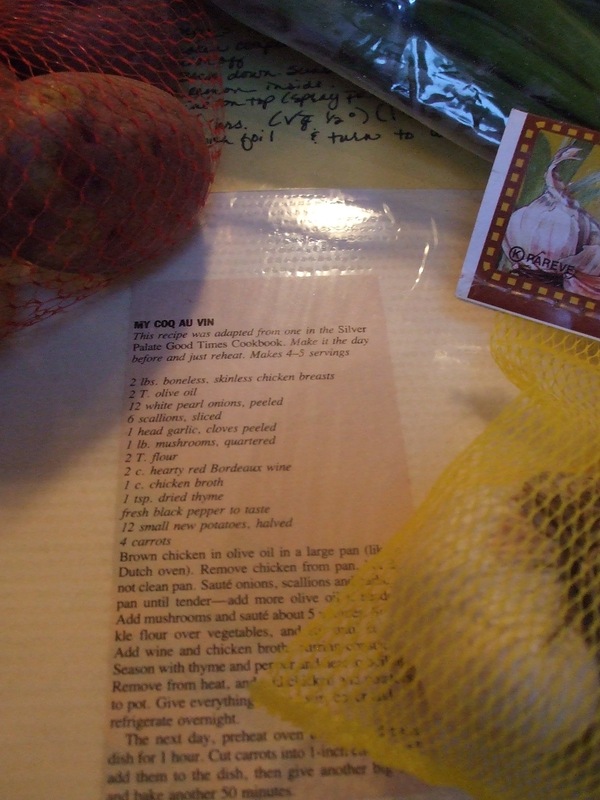 …..just hoping you share the coq au vin recipe as you have shared your heart and joys with us. I am awestruck by being the recipient of someone else’s comfort food. My mom has entered my kitchen and has marked her territory on every flat space available. As I sit on the couch in hopeful expectation of the birth of our little one, my mom is trying to love me in the best way she knows how, when she can’t make the waiting time go any faster. With coolers and boxes full of “Minnesota ingredients,” my parents arrived at our doorstep two days ago and my mom has been in the kitchen ever since filling our freezers with minnesota wild rice soup, lasagna, squash soup, and even the forbidden childhood favorite sloppy joes (I think I was in my preteens the last time I tasted this crock pot wonder), scones, muffins, banana bread, quiche and homemade spaghetti sauce. It’s not so easy to defer and let someone else mix, bake, stir and saute in my kitchen, but I know my mom is mothering me in the best way she knows how, so I in turn can begin this calling of being a mother myself. My mom would have agreed with every word you wrote here. At her Passover table there were at least 5 kinds of haroset: with dates because that’s how my uncle liked it, traditional to make sure nobody was disappointed, without extra sugar or juice for diabetics, usually some kind of extra fancy kind dreamt up to wow and impress, and a small bowl of super pureed haroset set down quietly next to my aunt with denture troubles. It got to the point where meals started with a 10 minute preamble because each version of each dish had to be explained to make sure each guest got exactly what he or she liked most. As a teenager it used to annoy me a little, but now just thinking about it makes me miss her so! !